Jean-Louis is a Catholic engineer with an interest in mathematics and a dislike for Blaise Pascal (the mid-1600’s scientist and philosopher). JL meets up with old long-time-no-see friend Vidal, who takes him out dancing and then to visit Vidal’s friend Maud, a single mother, at her house on Christmas night. The section at Maud’s house must be at least a third of the film’s running time. Vidal is attracted to her, but she’ll have none of that. He gets drunk and finally walks home, Leaving JL to fend for himself. They talk about life, love, religion and Pascal, JL sleeps next to Maud but they only kiss once. The next day JL meets Franciose, a girl he has noticed at church, and makes a date with her, then joins Maud and Vidal out hiking in the snow, talking like comfortable old friends. Another friendly kiss. JL gives Francoise a ride home, stays over at her place (but in a separate room), flash-forward they are married with a kid, he meets Maud, and we find out that Francoise had an affair with Maud’s ex husband, but all is forgiven and the family goes to romp in the surf. On the film’s style, Kent Jones says “No one’s films are more ‘written,’ more narrative based, or more logistically tied to particular places and times of year.” True that, an extremely talky picture, and reliant on its snowy seasonal setting. Finely but simply shot in black and white. No real visual or plot excitement, no stylistic heightening of mood or emotion, but a deeply thought-out script and characters evolving before our eyes. This particular week from Christmas to New Year’s is one of the most important in JL’s life, and we see (or hear) his changing and challenged beliefs, principles and decisions, creating the kind of real human complexity very rarely seen in movies. Came out a decade after its closest (so far) kin in New Wave cinema, The 400 Blows, probably the quietest and most reserved film of 1969, the year of The Gladiators, Mr. Freedom, Topaz, Satyricon and Easy Rider (but to be fair, also the year of Andrei Rublev, Passion of Anna and Army of Shadows). Third of the Six Moral Tales, the last four of which were shot by Néstor Almendros, who also worked with Truffaut and Barbet Schroeder and later shot Days of Heaven. What are the chances that Jean-Louis and Maud will have a life together? Based on her luck with men and his avowed preference for Catholic blondes, not so great. Based on their immediate affinity for each other, not so small. 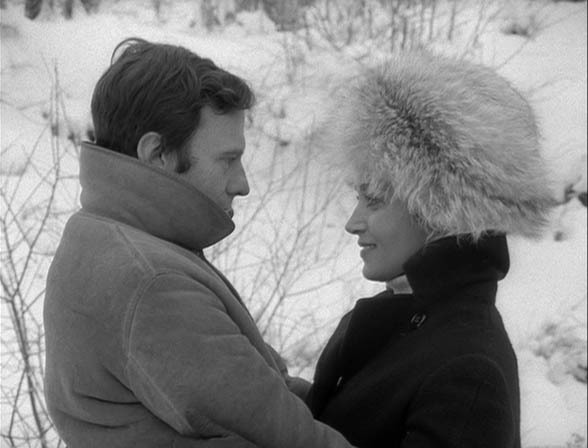 “You are a happy soul, despite appearances,” observes Maud of Jean-Louis—and the essential rightness of this observation is what makes Rohmer a greater artist than Bertolucci and also points to what gives My Night at Maud’s its special spark and effervescence. 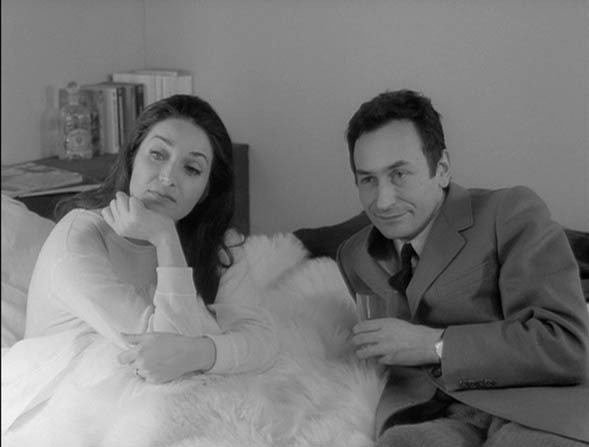 … Current fashion would favor Maud as the voice of reason when she tartly dismisses Jean-Louis’ prevarications: “I prefer people who know what they want.” Yet there’s something equally admirable about Jean-Louis’ insistence on adhering to his story and fulfilling his own platonic conception with Françoise, a decidedly unhappy soul. The necessity of choice, the pain of choice: no film is better at illuminating these two ­equally real aspects of living. There are no moments of grace in My Night at Maud’s. … Yet there are intimations of grace in the slow, serpentine movement toward intimacy between Maud and Jean-Louis. Movie picked up a few screenplay awards, but mostly beaten out by the big political films of the era – Lindsay Anderson’s If… for feature at Cannes, Costa-Gavras Z for foreign film oscar and, ahem, Patton for screenplay oscar. Vidal – Antoine Vitez (a smallish part in Truffaut’s The Green Room). Jean-Louis – Jean-Louis Trintignant, who worked with (in order) Roger Vadim, Jacques Demy, Alain Robbe-Grillet, René Clément, Claude Chabrol, Costa-Gavras, Bertolucci (star of The Conformist), André Téchiné, Kieslowski (Red), and Patrice Chéreau (Those Who Love Me Can Take The Train).